Bus from Kuala Lumpur to Parit Buntar is the one most convenient mode of transport to travel to Parit Buntar from Kuala Lumpur TBS. Even under stiff competition from the popular ETS train service, bus from Kuala Lumpur to Parit Buntar remains competitive. Since the launching of the KTM ETS train, many commuters opt to go Parit Buntar from KL by ETS train. However, the demand is always higher than the supply, thus commuters always find it difficult to get a train ticket from Kuala Lumpur to Parit Buntar. Thus, many still travel with bus from KL to Parit Buntar. 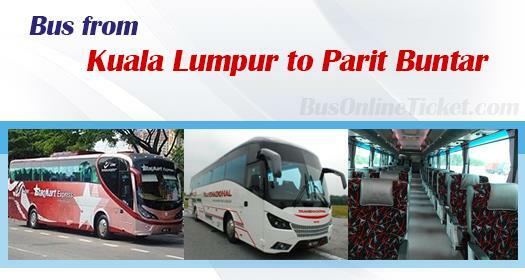 As a result, bus service remains one of the important option to travel from Kuala Lumpur to Parit Buntar. Transnasional and Starmart Express are the two famous bus operators operating bus service from Kuala Lumpur to Parit Buntar. Transnasional, the national transport company, is the dominant player in this route service by providing 15 schedules daily. The bus schedules for bus from Kuala Lumpur to Parit Buntar is starting from morning 9:30AM until night 11:30PM. The duration required for bus from Kuala Lumpur to Parit Buntar takes about 4 hours, depending on the traffic and weather condition on the day. One stopover will be given for passengers to grab some snacks and go for washroom break. The adult fare for bus from Kuala Lumpur is reasonably charged at RM 30.70 by Transnasional and RM 35.00 by Starmart Express. Transnasional also provides child fare at RM 23.10. Commuters with travelling children opts for Transnasional because it's child fare. Bus from Kuala Lumpur to Parik Buntur has two pick-up points at either Terminal Bersepadu Selatan (TBS) and Hentian Duta Bus Terminal. The drop-off point is Hentian Raya Parit Buntar. Even though there are many departure times for bus from Kuala Lumpur to Parit Buntar, passengers are advised to book bus ticket online to prevent disappointment. Book you bus ticket now in BusOnlineTicket.com just one click away!